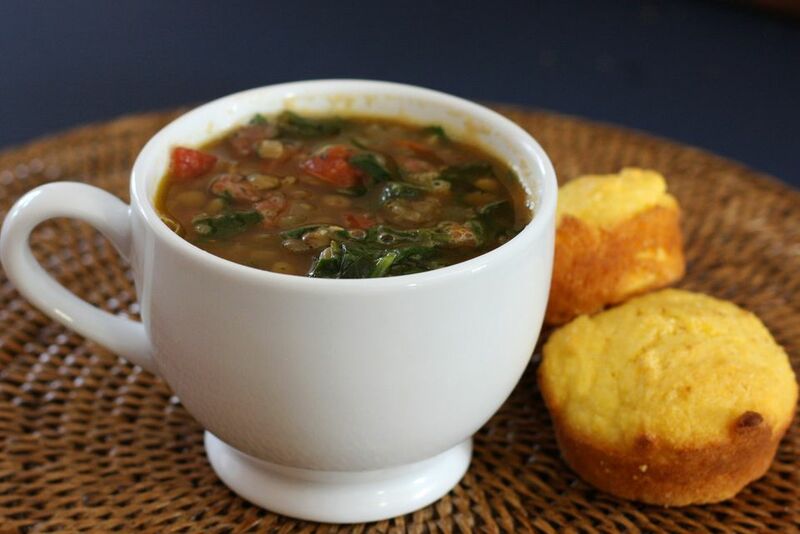 This delicious lentil soup is made with spicy smoked sausage and spinach, along with a Cajun or Creole seasoning blend and diced tomatoes. The soup is a wonderful combination of ingredients. If you like a lighter soup, consider using chicken or turkey smoked sausage or kielbasa. Or use leftover diced ham instead of sausage. This lentil soup cooks relatively quickly on the stovetop. If you prefer a soup that cooks all day in the slow cooker, take a look at this crock pot lentil soup with bacon. Enjoy the soup with freshly baked cornbread or Southern buttermilk biscuits. Or serve it with a crusty baguette. In a large saucepan or Dutch oven over medium heat, saute the onions, celery, and carrots in the olive oil until onion is tender. Add the sausage slices and cook to lightly brown. Add the lentils, seasoning blend, cayenne, thyme, pepper, chicken broth, and tomatoes; bring to a boil. Reduce heat to low, cover, and continue cooking for 1 hour, or until lentils are tender. Add salt, to taste, and spinach. Cover and continue cooking for 10 to 15 minutes longer.